The Bobcats put up another letdown of a game on Saturday night, losing to the Atlanta Hawks (who were without starters Al Horford and Marvin Williams) 103-87. This came as a very disappointing loss, considering the Hawks had just incurred a 41-point loss the previous night. I expected a much hungrier team to come into the Cable Box, but I thought the Bobcats could gut out a win against the team without their starting center and small forward. I was wrong. The game was back-and-forth for much of the first half, with the Bobcats leading by five going into the break. Then the Bobcats once again encountered their immortal enemy, the third quarter. While the Bobcats scored around the same points as the previous quarters, their defense was thoroughly torn apart as the Hawks ran away to the 16-point win. 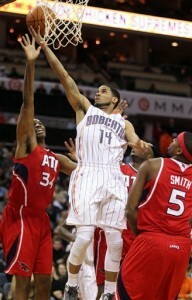 On the night, the Bobcats were led by D.J. Augustin who dropped 20 points and 7 dimes with zero turnovers. Stephen Jackson and Gerald Wallace both put up clunkers, combining for 5-23 shooting from the field, though Gerald Wallace was better because he rebounded and helped keep his man below his scoring average. Defensively, Jackson was destroyed by Joe Johnson and Boris Diaw had problems with über-athletic Josh Smith. In the first half, the Bobcats were playing very well, shooting the ball at a decent clip (50% FG, 40% 3P) and they out-rebounded Atlanta by a small margin. With a five-point lead and only three turnovers at the half, Charlotte was playing as good basketball as they could with Gerald Wallace struggling and Stephen Jackson ending the half poorly after a nice first quarter. The bench also played well, centering around Shaun Livingston and Nazr Mohammed who combined for 9 points in the second quarter. From there it went to Hell in a handbasket. The Bobcats got progressively worse in the third, shooting 37% from the field, getting fewer assists and rebounds, and more turnovers than the first two quarters. Stephen Jackson missed all six of his shots and Gerald Wallace was basically just a non-factor. And that was just offensively. On defense, the Hawks got pretty much whatever they wanted, scoring 32 points on 58% from the field and 57% from behind the arc, while grabbing 5 more rebounds, two more assists and without turning the ball over once. Though Augustin was great on offense in the third was rightfully left in for all of the quarter, he had trouble defending MIKE BIBBY, who scored 14 points on the night. From there it was basically over. The team had no momentum, Jackson was shooting the team in the foot both with his offense and his inability to slow down Joe Johnson (though you have to give J.J. credit – he was basically unconscious the whole game), and the Bobcats just didn’t have the firepower to make a comeback attempt. Dammit, give it up for Shaun Livingston. I watched him check into the game to neither deafening cheers nor applause (or anything close to that). The man deserves better. I love having him on the Bobcats and I would rather he never leave. He’s a good influence in the locker room and has great athletic gifts on the court. But if he’s not going to get the respect he deserves, I think I’d rather he leave and go somewhere else. He was exceptional tonight, shooting 4-6 from the field with three rebounds (one offensive), four assists and two steals for 9 points. Plus he had a couple highlights, including some smooth post moves and this put-back dunk. As far as other guys who performed pretty well on the night, there was Gerald Henderson (4-7 FG, 2 REB, 1 AST, 8 PTS), Nazr Mohammed (5-9 FG, 7 REB, 1 AST, 2 BLK, 1o PTS) and Boris Diaw (5-7 FG, 2-2 FT, 7 REB, 4 AST, 2STL, 1 BLK, 12 PTS). Those are excellent, efficient stat lines right there. Kwame Brown wasn’t bad either, but I expect him to rebound better against the Hawks’ backup center, Zaza Pachulia. Since Paul Silas arrived as the interim head coach, I’ve been waffling on whether I think the Bobcats should blow the team up or not. There have been nights when they just look fantastic but then there are nights when they just look like the doo-doo I just stepped in on my front lawn. I think I’m coming closer to my decision. In my mind, the Bobcats should definitely try to trade Stephen Jackson at all costs. He’s incredibly inefficient on offense, which kills the team since he consistently take about 15 shots per game. As for who to keep, I have three different categories: must keeps – Augustin, Tyrus Thomas, Henderson; should keeps – Derrick Brown, Livingston; and like-to-keeps (those who I’d prefer to keep, but ultimately would understand if we traded them, permitting we get value in return) – Gerald Wallace, Boris Diaw. It’s a youth movement folks; don’t trade for cap space. Trade for young talent or draft picks, not just expiring contracts. Cap space doesn’t win championships for a small market team, end of story. Next on the schedule is Tuesday’s game at the Sacramento Kings at 10:00 p.m. EST, as the Bobcats begin a six-game road trip (Kings, Suns, Warriors, Clippers, Jazz, Pistons).